The studio bosses at Twentieth Century Fox must have been licking their lips when Nunnally Johnson’s screenplay for ‘How To Marry A Millionaire’ landed on their desks. 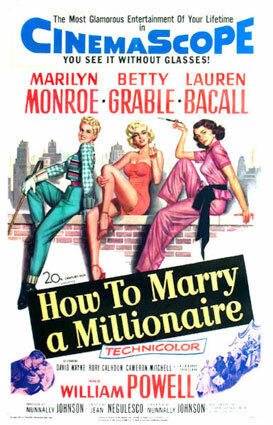 With it’s racy plot about a trio of fashion models who rent a flash apartment in New York City in order to ensnare filthy rich husbands, the film couldn’t help but be a winner. All they had to do was to wrangle from their stable three of the screen’s most sensational sirens to star in it, parade them around in a series of knock-out frocks designed by Billy Travilla and Charles Le Maire, and watch the box office boom. Fortunately, their stellar pin-up girls didn’t disappoint, delivering non stop cinemascopic eye candy and witty repartee with well practiced panache. Lauren Bacall is in top form as Schatze Page, making a beeline for the elderly oil baron J.D. Harley (William Powell), insisting that she’s always liked older men; “Look at that fellow, what’s his name, in The African Queen. Absolutely crazy about him.” Humphrey Bogart, of course, was Bacall’s hubby at the time. Betty Grable also makes a wry reference to her ex husband Harry James while snowbound in a log cabin with the wealthy but neurotic philanderer-in-the-making Fred Clark (Waldo Brewster) who is abruptly usurped in his endeavours by the park ranger Rory Calhoun (Eben). But it’s Marilyn Monroe who steals the show as the blind bombshell Pola Debevoise, reading a book upside down while catching a plane to Kansas City having mistook it for the one to Atlantic City. To her, everything looks “creamy”, especially her final catch – an equally short sighted man on the run from the Internal Revenue agents. The moral of this story is that money isn’t everything. But good things come to those who follow their heart.